Facebook is the world largest social network. The simplicity and speed are the best advantages of Facebook. Before publicity of Facebook, Google's Orkut was the largest social network site. But it was very slow with slow internet connection. At that time, many were using low internet connection like Dial up connection instead of broadband connection. At the innovation of Facebook, that was very compatible with low internet connection. So most of peoples were depended the Facebook for social networking. Now may are using broadband connection instead of dial up connection, nevertheless peoples are not like to leave Facebook, because their friends are still on (line on) Facebook. Find stranger friends but he is our neighbor, and we have no idea about him. Before some days, one of my friends said his experience: He has sister. Friend and his sister are living in a same house. But they were not friendly. He was in his own way and she was in her own way. No much relation between them. But one day, he saw her in Facebook as online. He just said hi, and more. From that time they understand each other. Now they are really good brothers and sisters. 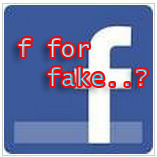 Here Facebook made a good relation between them. Like this, Facebook has many successful stories. Nevertheless, Facebook has many disadvantages. Fake Facebook accounts are the reasons of such major problems.Facebook officers said that, there are above 8.3 fake Facebook accounts are there..! Facebook has 95.5 crore total users. But 8.7 % of total users are fake users.. In accurate, 8.309 crore accounts are fake. Three types of fake accounts are there.. These are another accounts made by existing user. Facebook has 4.8% duplicate profiles among total profiles. These are the additional profiles made for business, institute, pets etc. Facebook has 2.4% of misclassified profiles among total profiles. Policies. Facebook has 1.5% undesirable profiles. So keep away free duplicate accounts. Your best Facebook friend may or may not be fake. Take Care..